A mid-century house in Tucson, Arizona finally gains a formal main entrance and some more with clever landscaping – planned and executed by Ibarra Rosano Design Architects. 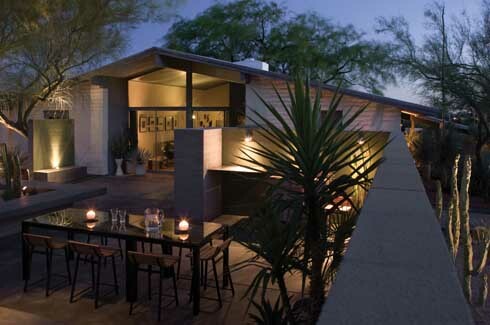 In the hauntingly beautiful desert area of Tucson, Arizona, visitors to the mid-century Moltz residence have always entered the house from the utilitarian door which faces the front instead of the main door located on the side. Since the ambiguous entry proved to be a constant source of embarrassment for the owners who regularly entertained friends at home, they finally decided to change the energy of the house by re-orienting the entry and creating an inviting outdoor space where they could continue to entertain friends and family. 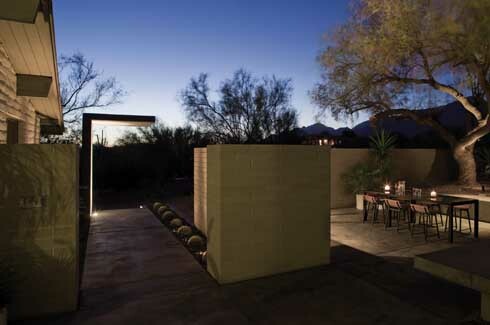 Enter Ibarra Rosano Design Architects, an award-winning Tucsonan firm, well recognised for its minimal and modern desert architecture. Initially reluctant to take on just a landscaping project, the firm eventually relented when they realised the brief included more than just landscape design for the 1300 sq.ft outdoor space. 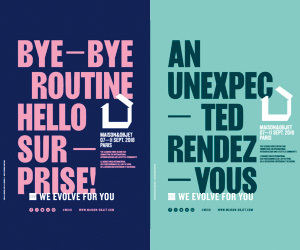 Luis Ibarra and Teresa Rosano, co-founders of the design firm relate, “Our requirement was to create a framework which would help make sense of the existing random plantings and the slope of the terrain. This impossible-to-miss stylish marker leads visitors inside towards the front door of the house and towards the patio where a fluid arrangement of horizontal planes in coloured concrete bring order, utility and sophistication to the outdoor space. 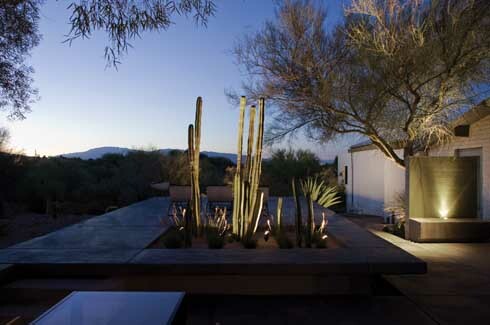 “One of the main goals behind the Moltz landscape design was to entice the homeowners and their guests to enjoy the spaces outside of the home, effectively increasing the house’s living area without adding air-conditioned square footage,” says Teresa Rosano referring to the creation of an outdoor kitchen which makes perfect sense considering Arizona’s warm climate. A rectangular glass dining table sits invitingly in the kitchen space and the presence of a grill, aluminium counter and shelf suggest that the owners often enjoy an outdoor, interactive dining experience. A judicious selection of cacti, succulents and native plants balance the concrete floors and walls without overwhelming the space. 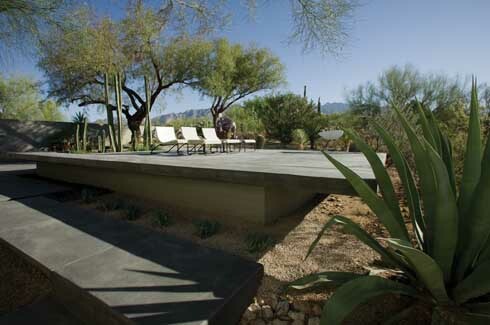 But it is the landscaped patio which easily forms the most stunning feature of the outdoor space. Here multi-level horizontal planes in concrete replace the original brick patio and the clever arrangement makes provision for in-built planters and benches. A row of deckchairs placed on the cantilevered concrete is perfect for lounging and the owners record their experience here as a sensation of floating into the horizon. One of the challenges of landscaping involved taming a group of randomly arranged mature trees on the east side of the house. “An ordering system was needed to rationalise their presence and harvest their shade,” says Teresa. Adding to the natural flora is a selection of potted cacti, succulents and native plants that are drought-resistant; these are discreetly arranged across the outdoor space. The tall cacti stand regally and command a sense of awe as they create interesting compositions by day and provide dramatic accents by night. A deliberately restrained palette of cast concrete, concrete block, glass tile and native plants ensures that while tidiness and order are bestowed upon the patio, the overall effect is one of a seamless blend with the natural environment. The outdoor living space allows the owners to take advantage of South Arizona’s climate and mountain views all year round. The ability to create modern spaces that co-exist in perfect harmony with their surroundings is the trademark of Ibarra Rosano, a firm inarguably tilted towards sustainable living. The lighting in the Moltz house for instance is low-voltage, low-level and this Teresa believes pays an ode to the endangered nocturnal biodiversity. The use of drought-resistant plants and the creation of an outdoor living/cooking space further conserve important natural resources. The concrete used contains fly-ash, a recycled material. A large number of other materials used were also locally quarried, processed and manufactured. With their house now put in order and a lovely outdoor living area to boot, the Moltzs are lucky to have found a fairytale ending to their long standing plight.